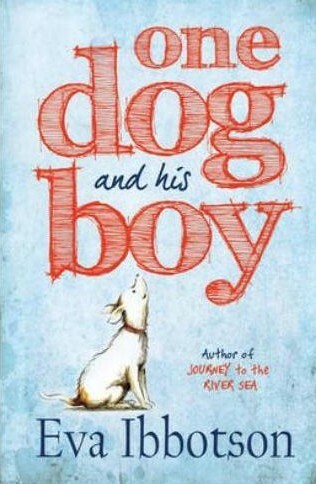 Over at Lady Business, I chat with Jodie (one of my absolute favourite people to talk books with) about why I’d happily move into an Eva Ibbotson novel if I could, about what makes her books such perfect comfort reads, about possible positive and negative aspects of her slightly old-fashioned sensibility, and about the delightful characters in her posthumous novel One Dog and His Boy, canine and human. Bonus: there are adorable pictures of one of my dogs (if I may say so myself). If you’d like to read our chat and be tempted into joining the Eva Ibbotson fan club, just click over! I just left my son's book fair at school five minutes ago and I noticed a copy of this. I tried to get my son to pick it for his book to bring home. I wish I'd known how wonderful it is or I would have pushed him a little harder. :) Maybe I'll sneak back in and pick up a copy. Another author who sits on my book shelf waiting patiently for me to notice her! I have a few of her teen books, the historical ones which I must read at some point. Enjoyed reading your review at 'Ladybusiness', Ana! Sorry to know that Eva Ibbotson won't be writing any more books. This book looks very different from a typical Eva Ibbotson book, because a typical book of hers seems to have a lot of adventure in exotic places. I enjoyed reading your and Jodie's thoughts on your favourite characters from the book and how Eva Ibbotson might have seen the world with rose-tinted glasses when she wrote her books. I can't believe that there are harpies resembling Margaret Thatcher in an Ibbotson book :) Loved the picture of your dog - he looks so handsome! This is unrelated to your review, but for some reason this question came into my mind. Have you read Eoin Colfer's 'The Wish List'? I'm very intrigued by the Margaret Thatcher harpies! :D I put her works on my tbr list when you first raved about Ibbotson and I get the feeling they might be perfect reading for thesis breaks. Oh wow, I absolutely loved A Countess Below Stairs (or The Secret Countess) but I hadn't looked into her other books at all - I feel so stupid about it now! Do you recommend any in particular or all/any of them? I've yet to read anything by Ibbotson. I'll have to rectify that soon. I will have to check out this author! Might be great to read with my granddaughter. Very nice blog! I had not ever heard of this author, but now you've gotten me curious! I am off to check out your post! My mother and me are both big fans of Ibbotson. I really take comfort from her old fashioned sensibilities and her simple but beautiful style. Never actually heard of this book though, will have to put it on my list!